USNS Lawrence H. Gianella (T-AOT-1125) is a United States Military Sealift Command product tanker which typically carries diesel, gasoline, and JP5 (jet fuel). Its reinforced bow allows it to occasionally make the yearly fuel delivery to McMurdo Station in Antarctica. 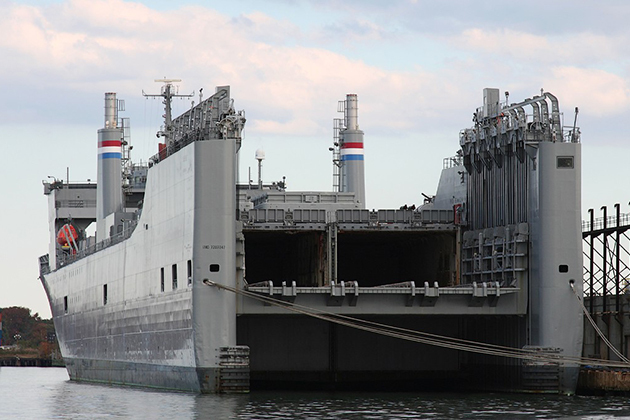 USNS John Glenn (T-ESD-2), is a United States Navy Expeditionary Transfer Dock ship named in honor of John Glenn, a Naval Aviator, retired United States Marine Corps colonel, veteran of World War II and the Korean War, astronaut, and United States senator. 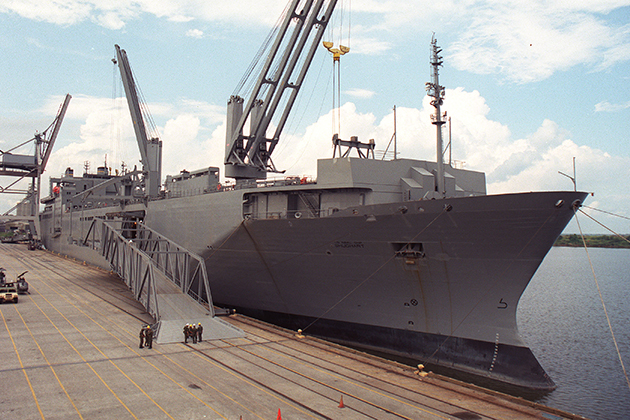 USNS Montford Point (T-ESD-1), the lead ship of her class of Expeditionary Transfer Docks (ESD), is a ship named in honor of African American Marine Corps recruits who trained at Montford Point Camp, North Carolina, from 1942 to 1949. SS Cape Island (AKR-10) was originally laid down for commercial service in 1976 as Illinois, a Type C7 ship for the States Lines. 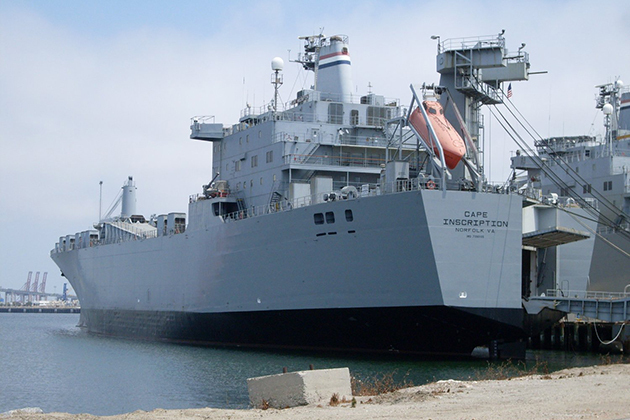 It was launched and then needed to be used for military service; it was transferred into the Naval Vessel Register (NVR) as the USNS Mercury, as transport ship for vehicles, and other goods. In 1993 the ship was permanently transferred to the Navy's roll as a ready reserve ship, and renamed Cape Island (T-AKR-10). The Cape Island remains laid up in a ready reserve state so that it may be activated in 5 days, if called upon. SS Cape Intrepid was originally laid down in 1975 as SS Arizona, a Type C7 ship intended for commercial or military use. On June 8th 1976 she was removed from commercial duty, reacquired by the United States Navy, and renamed USNS Jupiter to serve alongside USNS Mercury. On 8 June 1976 she was transferred to Military Sealift Command, and renamed the SS Cape Intrepid. Since then the ship has been active in transport roles including a long term attachment to the 833rd transport regiment. She is currently in reserve status and can be activated if called upon in 5 days as part of the ready reserve fleet. The SS Cape Inscription (AKR-5076) was originally launched in 1975 as the SS Maine, a Type C7 commercial ship. In September 1987 the ship was reacquired from its several commercial roles and brought back under military control under the Maritime Administration and renamed the SS Cape Inscription. Since then it has been kept in ready reserve status and used occasionally for heavy lifting operations to European theaters to have the equipment air-lifted to active engagements. The SS Cape Isabel (AKR-5062) was originally launched in 1976 as the SS Nevada, a Type C7 commercial ship. The States SS company took the first contract in 1976. 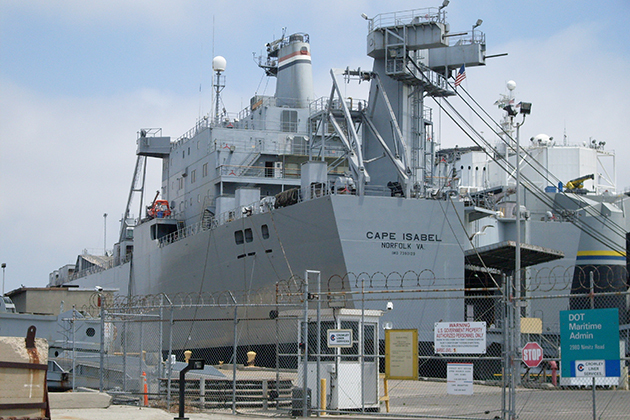 Later the ship was reacquired from its commercial roles, brought back under military control via the Maritime Administration, and renamed the Cape Isabel. Since then it has been kept in ready reserve status and used occasionally for heavy lifting operations to European theaters to have equipment air-lifted to active engagements. It has heavily participated in Operation Enduring Freedom ferrying goods across the Atlantic to staging points in Europe. SS Algol (T-AKR 287) is an Algol-class vehicle cargo ship that is currently maintained by the United States Maritime Administration as part of the Military Sealift Command's Ready Reserve Force. She was built as a high speed container ship by Rotterdamsche D.D.Mij N.V. in Rotterdam, Netherlands, and named SS Sea-Land Exchange. 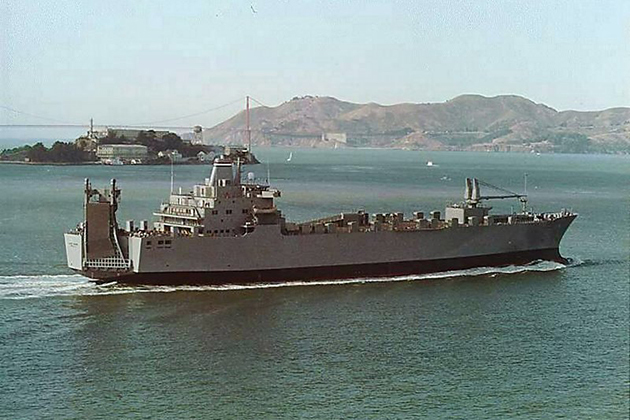 She was sold to the United States Navy in October 1981 and became USNS Algol (T-AK-287). In keeping with the pattern of the naming the Algol-class ships after bright stars, Algol was named after the bright eclipsing binary star Algol, known colloquially as the Demon Star, which is a bright star in the constellation Perseus. SS Capella (T-AKR 293) is an Algol class vehicle cargo ship that is currently maintained by the United States Maritime Administration as part of the Military Sealift Command's Ready Reserve Force (RRF). She was built as a high speed container ship by Rotterdamsche D.D.Mij N.V. in Rotterdam, Netherlands, and named SS Sea-Land McLean. She was sold to the United States Navy in 1982 and became USNS Capella (T-AK-293). In keeping with the pattern of the naming the Algol-class ships after bright stars, the Capella was named after Capella, the brightest star in the constellation Auriga, the sixth brightest in the night sky. USNS Maury (T-AGS-66) is a Pathfinder-class oceanographic survey ship. It is the seventh ship in the class. Maury is named after Commander Matthew Fontaine Maury, the "Father of Modern Oceanography" who famously resigned from the United States Navy to sail for the Confederacy. 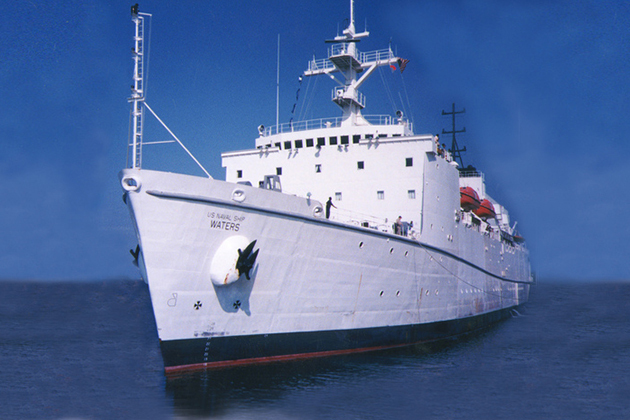 Maury is the first oceanographic survey ship built since USNS Mary Sears was launched in 2000. At approximately 350 feet, Maury is 24 feet longer than its other sister ships in the same class. This modification is to accommodate a 300-square-foot moon pool for unmanned vehicle deployment and retrieval. USNS Bowditch (T-AGS 62) is a Pathfinder-class survey ship. She is the third ship in the class. 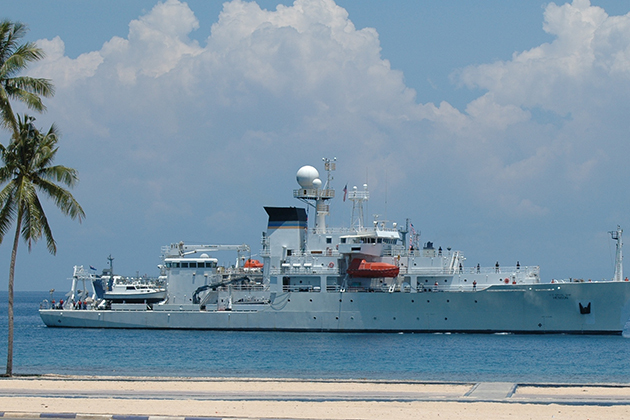 Bowditch is a part of a 29 ship Special Mission Ship program and operates in the South China Sea. She is named after mathematician Nathaniel Bowditch. USNS Waters (T-AGS 45) is a United States Navy vessel tasked with supporting submarine navigation-system testing and providing ballistic missile flight test support services. 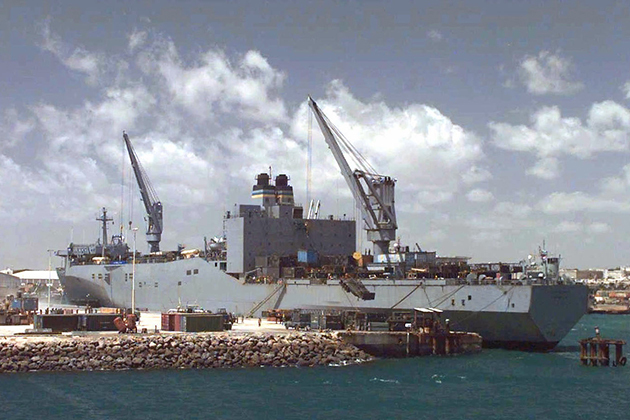 Waters is operated by Military Sealift Command to provide an operating platform and services for unique U.S. military and federal government missions. Special missions ships work for several different U.S. Navy customers, including Naval Sea Systems Command, Space and Naval Warfare Systems Command and the Oceanographer of the Navy. 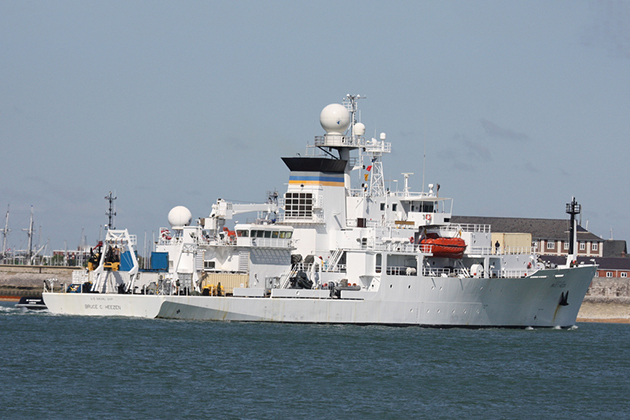 USNS Bruce C. Heezen (T-AGS 64) is a Pathfinder class oceanographic survey ship. It is the fifth ship in the class. She is named after Bruce C. Heezen, who was the leader of the team from Columbia University that discovered the Mid-Atlantic Ridge during the 1950s. The ship was the first Navy vessel to be named by civilians. Nine students from Oaklawn Elementary School in Cranston, RI named the ship after winning a contest sponsored by the Navy. 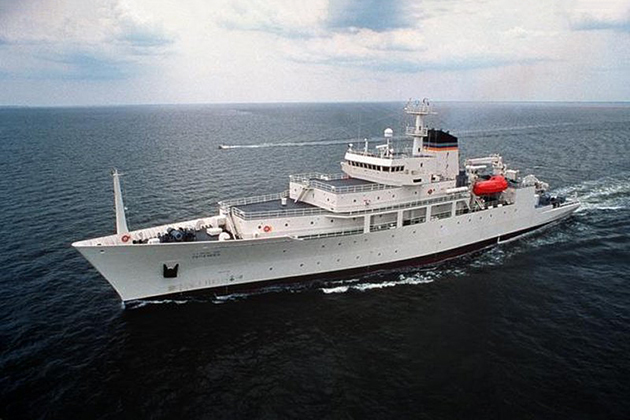 USNS Pathfinder (T-AGS 60) is an oceanographic survey ship, and the lead vessel of her class. 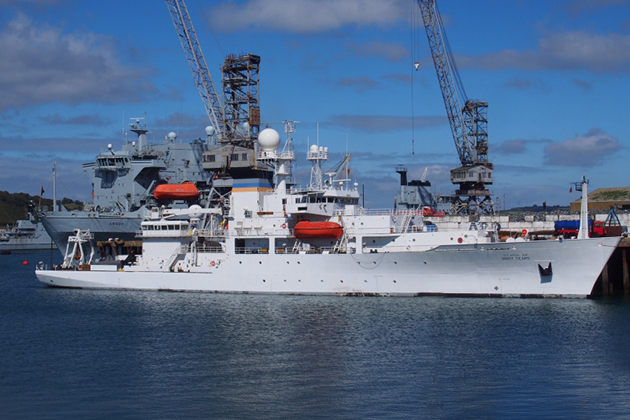 The Pathfinder-class survey ships have three multipurpose cranes and five winches plus a variety of oceanographic equipment including multibeam echo-sounders, towed sonars and expendable sensors. 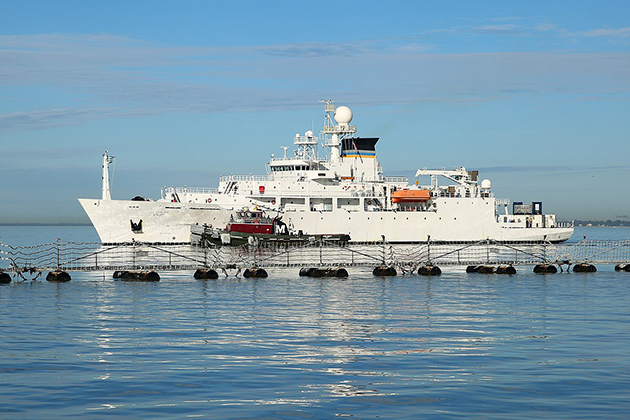 These ships are capable of carrying 34-foot hydrographic survey launches (HSL) for data collection in coastal regions with depths between 10 and 600 meters and in deep water to 4,000 meters. 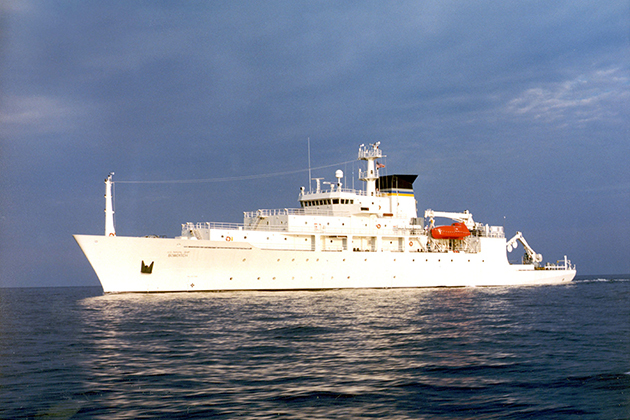 USNS Henson (T-AGS-63) is a Pathfinder class oceanographic survey ship. It is the fourth ship in the class. Henson is named after Matthew Henson, who accompanied Robert Peary, most famously on an expedition intended to reach the Geographic North Pole in 1909. The ship participated in the search for the remains of the USS Bonhomme Richard off the coast of Flamborough Head, England, during the week of 10 September 2010. USNS Yano (T-AKR-297) was originally constructed as the container ship Leise Maersk in 1980. In 1987 the ship was lengthened, and again in the 1990s before it was purchased by the United States Navy. When the transfer was complete the ship underwent a conversion to a large, medium-speed, roll-on/roll-off ship. 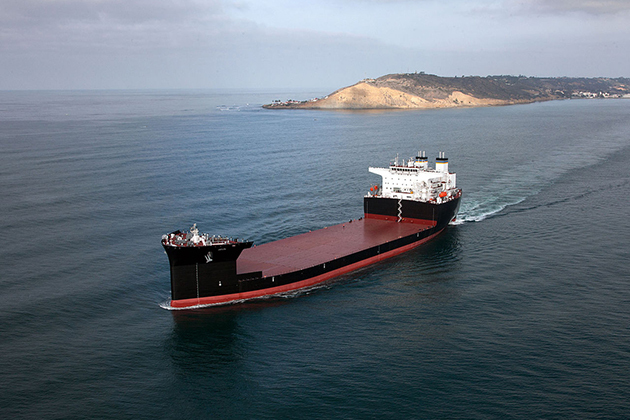 Yano entered service under Military Sealift Command in 1997, and was named after Medal of Honor recipient United States Army Sergeant First Class Rodney J. T. Yano. 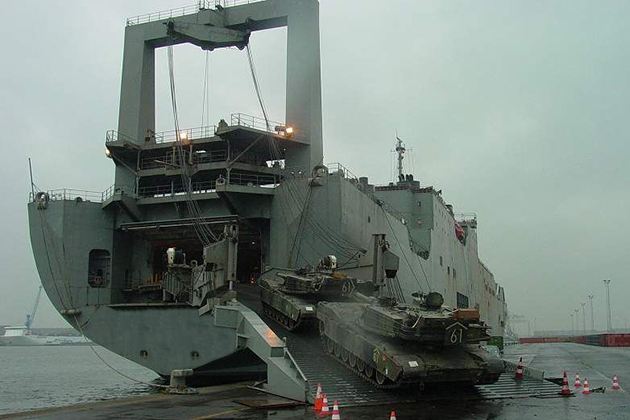 It has since served a role in basic military transport of material to bases around the world and served a vital role in the transport of material to both the Iraq and Afghanistan wars. USNS Shughart (T-AKR-295) is the lead ship of her class of cargo ships. She is a "roll-on roll-off" non-combat United States Navy ship originally named the Laura Maersk. 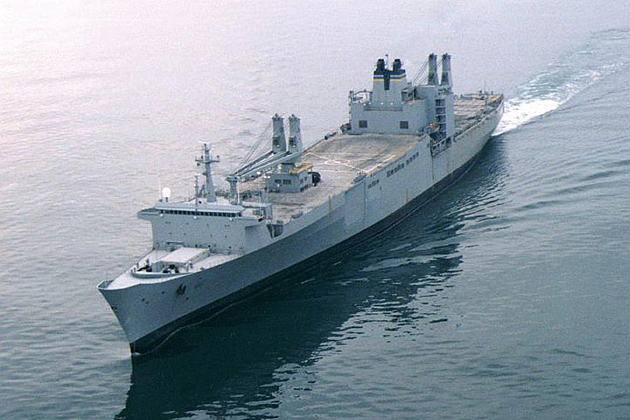 In 1996 she was delivered to Military Sealift Command and renamed in honor of Medal of Honor recipient US Army Sergeant First Class Randall D. Shughart. The USNS Shughart, along with others in her class, is capable of carrying 58 tanks, 48 other track vehicles, plus more than 900 trucks and other wheeled vehicles. 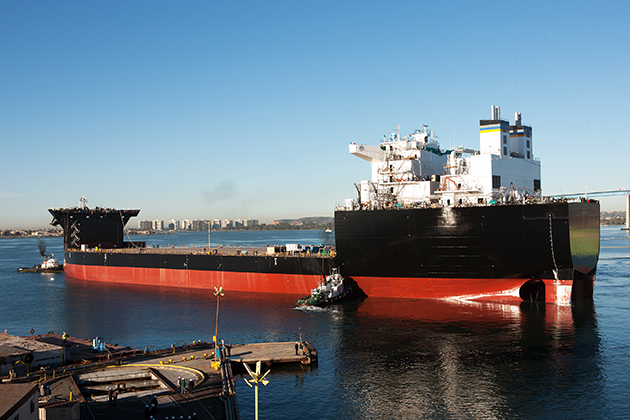 To manipulate the immense cargo capacity, Shughart utilizes two 110-ton cranes, port and starboard ramps, and a stern ramp. 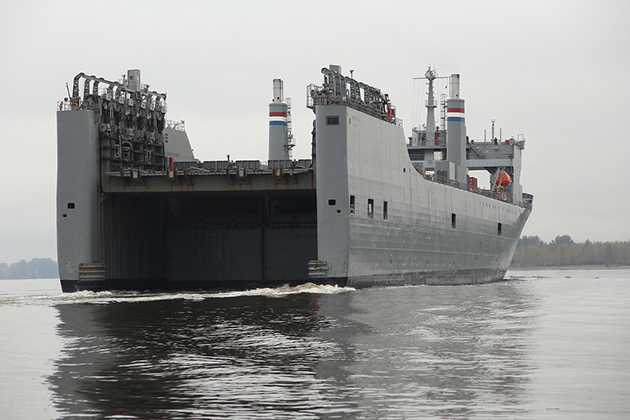 USNS Gordon (T-AKR-296) is a Gordon-class vehicle cargo ship of the United States Navy. She was originally built as a merchant vessel but later acquired and converted by the Navy and assigned to the United States Department of Defense's Military Sealift Command. She was named USNS Gordon after Medal of Honor recipient Master Sergeant Gary Gordon. 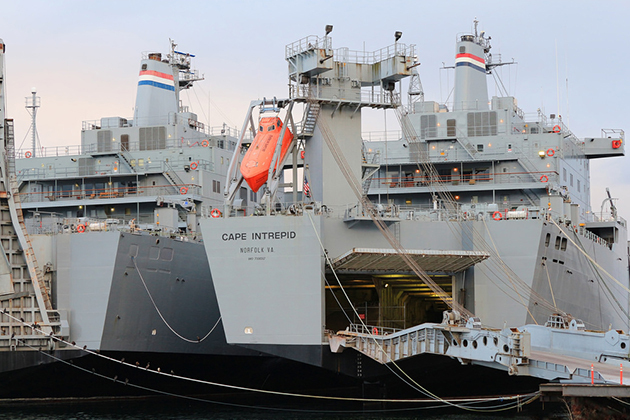 USNS Gordon is one of 28 Strategic Sealift Ships operated by the Military Sealift Command. 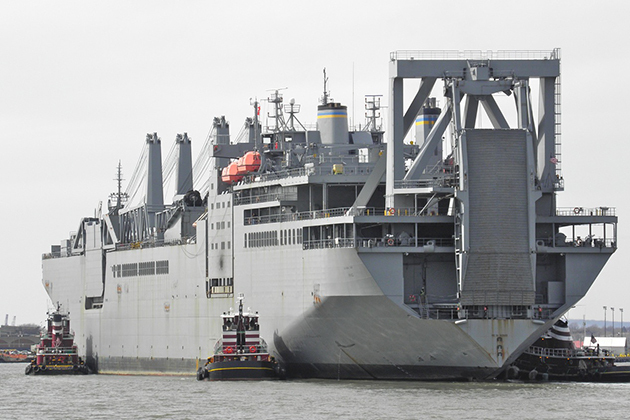 USNS Gilliland (T-AKR-298) is a Gordon-class vehicle cargo ship of the United States Navy. She was originally built as a merchant vessel but later acquired and converted by the Navy and assigned to the United States Department of Defense's Military Sealift Command. She was named after Medal of Honor recipient Corporal Charles L. Gilliland. 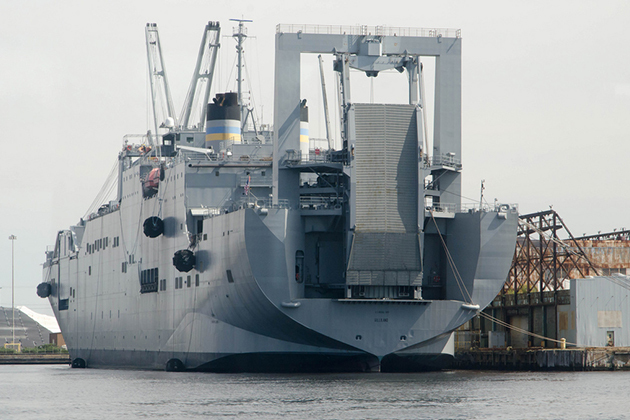 Gilliland is one of 28 Strategic Sealift Ships operated by the Military Sealift Command. SS Cape May (T-AKR-5063) is a steam turbine powered heavy-lift SEABEE barge carrier, one of two ships of her type in the Military Sealift Command's Ready Reserve Force. She was originally built as the Maritime Administration type (C8-S-82a) hull SS Almeria Lykes for commercial use. She was turned over to MARAD 25 July 1986, and assigned to MSC's RRF as SS Cape May (AKR-5063). Cape May is used in various tasks for the US military in heavy transport of goods in various theaters of action. She is currently in ready reserve status ready to be called upon for any large cargo work needed. The SS Cape Mohican (T-AKR-5065) is a steam turbine powered heavy-lift SEABEE barge carrier, one of two ships of her type in the Military Sealift Command's Ready Reserve Force. She was originally built as the Maritime Administration type (C8-S-82a) hull SS Tillie Lykes for commercial use. 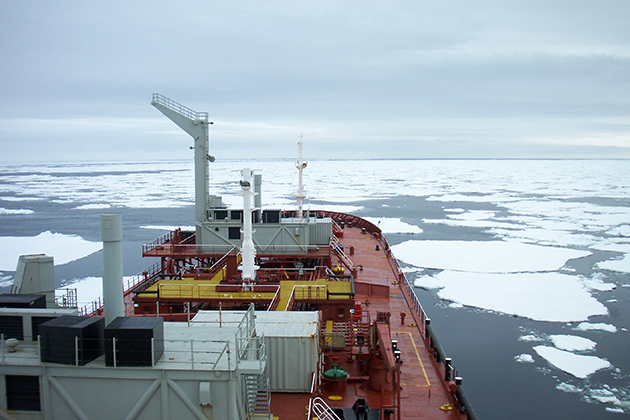 She was turned over to MARAD on 20 March 1986, and assigned to MSC's RRF as SS Cape Mohican (T-AKR-5065). Cape Mohican was activated for service during Desert Storm, and has performed various transportation duties over the years. She is part of the National Defense Reserve Fleet (NDRF). Regular maintenance and sea trials keep her ready to activate on five days' notice. We encourage potential customers to contact us for additional information.